Welcome to our joint parish website! Our website is easy to use and is compatible with new devices like smart phones and tablets. Our Mass Schedule for the upcoming seven days is now available on every page of our website. During this Lenten season I want to focus on God’s MERCY. This year our Sunday Lenten readings (Cycle C) tell us about God’s mercy through the parable of the prodigal son and forgiveness of the woman being stoned because of the sin of adultery. We need God’s mercy because we are dependent on him for all good gifts and his forgiveness when we sin. We receive mercy in the Sacrament of Reconciliation, in the Eucharist, and in many ways in our everyday lives. We are given this penitential time of prayer, fasting, and almsgiving to invite Jesus to change us. Holy Thursday Mass of the Lord’s Supper on April 18, at 7:30 p.m. at St. Mary Church, Bloomington with Eucharistic Adoration until 10:00 p.m.
Mark your calendar and plan to attend St. Charles Fish Fry on Friday, April 12, from 5:00-8:30 p.m. in St. Charles gym. The menu will consist of baked and fried fish, coleslaw, grilled cheese, cheese curds, potato chips, dessert and drink. The cost is $11.00 for adults, $7.00 for children ages 6-12 and carry-outs are $11.50. Mark your calendar for the Spring Scholarship Breakfast on April 7, 2019, with serving from 8:00 a.m. to NOON at St. Charles School featuring whole hog sausage, scrambled eggs, pancakes (plain and blueberry) and French toast, orange juice, white and chocolate milk, water and coffee. The cost is $8.00 for adults and $4.00 for children 12 years old and younger. Next weekend we will celebrate Palm Sunday. 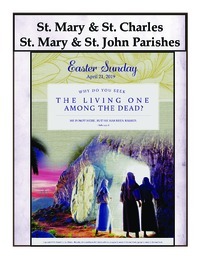 Please note that the Sunday Mass at St. Charles will be at 11:00 a.m. instead of 10:30 a.m.